Next Thursday October 10th, the Fade To Mind record label will invade Brooklyn’s club of the moment Output for their first formal label party. 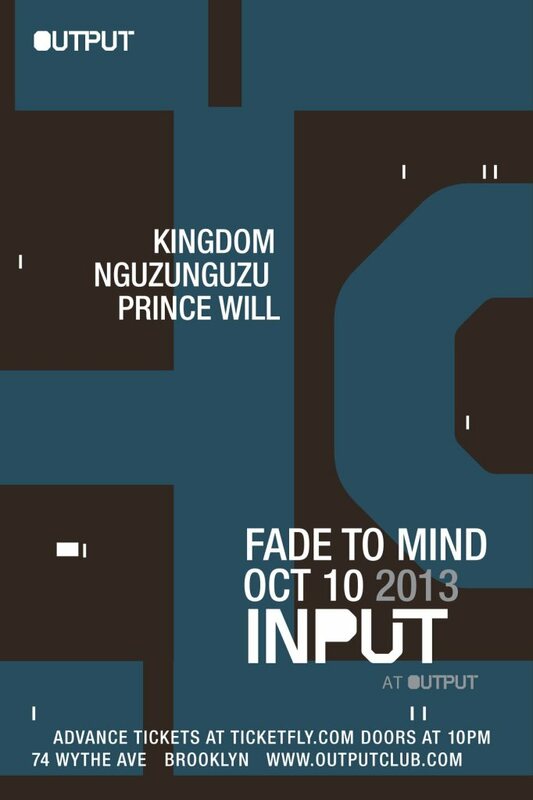 Head honcho, Kingdom, will be playing alongside the other key players on the Fade team, NGUZUNGUZU and Prince Will, for a night of pure bass vibes. Kingdom calls it, "a record label and a movement, a series of club nights and cooperative projects in music, visual art, video, and apparel.” For those of you looking to delve deep into the depths of the underground we suggest you don’t sleep on this one and to further prove our point, we have teamed up with Output to give away a pair of tickets for the night! For contest details and to purchase tickets, we have provided detail below. And to gear you all up for the event, we have left some of our favorite tunes from the artists scheduled to perform. See you there!